Earlier this year, Houzz released their annual Kitchen Trends Study based on survey responses by over 1,700 homeowners across the United States. The respondents were asked about their recent or planned kitchen renovation projects, and the results are very much in line with what our team highlighted in our own 2018 Home Remodeling Trends guide. While Houzz included decluttering, changing preferences for countertop materials and kitchen styles, and the growing integration of technology as the “Big Ideas” of the study, we’ve included a few highlights or our own that we felt were noteworthy. Major upgrades to larger kitchens (200+ sq.ft.) had an average spend of $42,000, while spend for minor upgrades to kitchens of the size cost about half as much ($22,000). Small kitchens (<200 sq.ft.) that underwent a major renovation cost homeowners an average of $25,800, while minor renovation work to smaller kitchens came in at $13,700. While a key takeaway from last year’s Houzz Kitchen Trends Study was the preference for modern and traditional kitchens, particularly among millennial homeowners, this year’s study finds that more respondents are opting for transitional kitchen styles. The battle for kitchen style supremacy continues, as transitional overtook contemporary after losing the top spot last year. This marks the third year in a year that these styles have swamped places as the preferred kitchen style in Houzz’s survey. The emergence of smart kitchen technology that we noted in our 2018 Home Remodeling Guide was echoed in Houzz’s study, with high-tech features like touchscreens and built-in speakers appearing in 25% of new kitchen appliances. 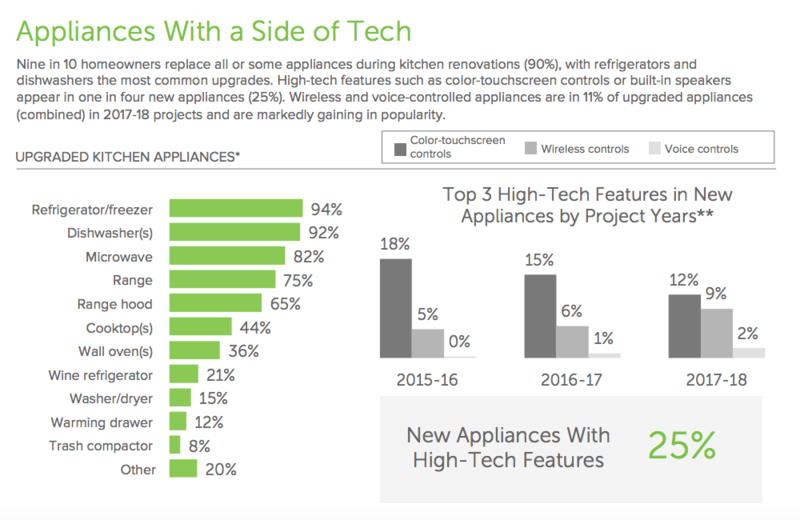 The study also reported that voice-control and wireless activation capabilities were featured in 11% of upgraded kitchen appliances in 2017-2018, a trend that is likely to grow as home technology evolves. No surprise here for most homeowners on the east and west coasts. 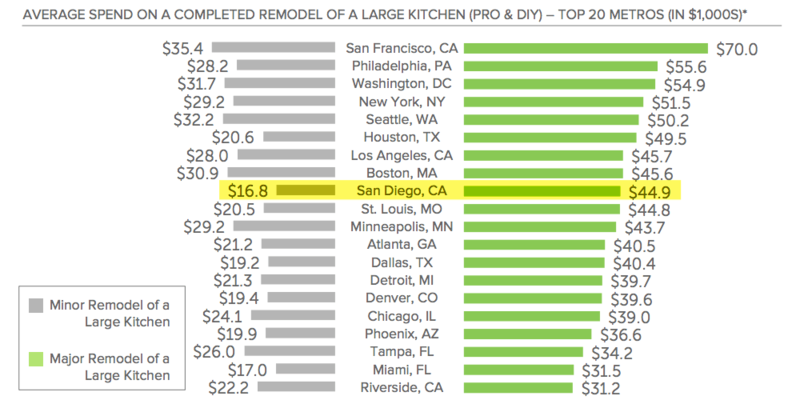 Residents in San Francisco, Philadelphia, and Washington D.C. can expect to pay the most for both major and minor upgrades to their large or small kitchens. 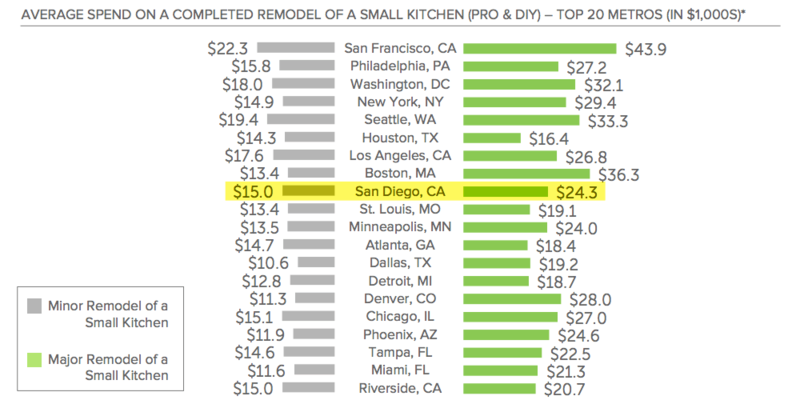 According to the survey, homeowners in the market for a kitchen remodel in San Diego can expect to invest between $45,000 - $17,000 for a large kitchen remodel, and around $25,000 - $15,000 for smaller kitchen renovation projects. Looking for more remodeling trends in 2018? Click the button below to see our complete guide.